The HSU Zoo team led the construction of the Speedwell Foundation’s Conservation Carousel at the Smithsonian Institution’s National Zoo. Although getting off to a slow start due to unforeseen conditions, once again HSU worked collaboratively with the Owner and Subcontractors to implement an action plan which resulted in on-time delivery. As planned, the grand opening of the Carousel coincided with the annual Zoo Lights Festival in November 2012. The Carousel features 58 hand-carved animals, including endangered species such as the giant panda and bald eagle, as well as other interesting critters like the naked mole rat and yellow jacket. It is one of the world’s first solar-powered carousels and is designed for a net-zero impact on the Zoo’s energy consumption. This important project was featured in many local and national news stories. 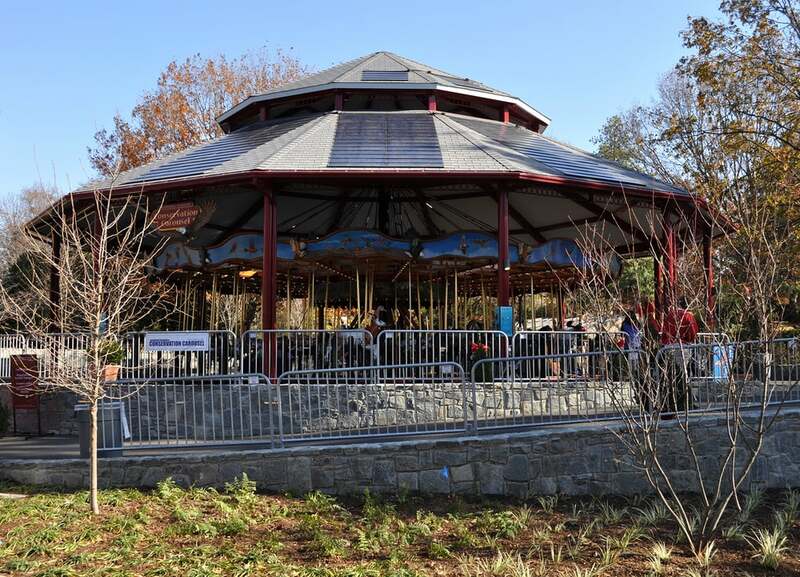 In addition to the major task of supplying a solar powered carousel, the project also included the installation of a full-service ticket booth. The old fashioned façade matches the old-fashioned appearance of the carousel - and like the carousel, the ticket booth is fully powered and conditioned.